Unionville right-hander Carter Parise set down six men in order to start the game. 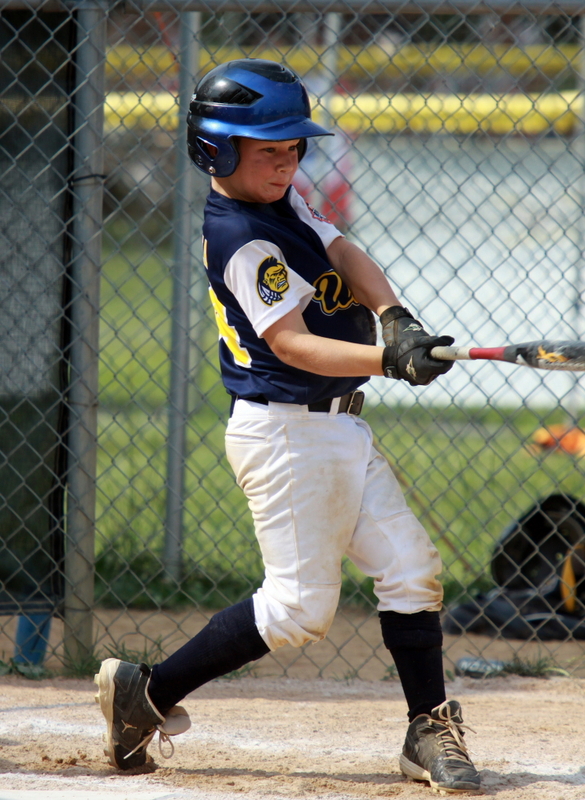 WARRINGTON—It’s hard to remember how the Indians responded the last time that they lost by the ten run mercy rule in a Cal Ripken League baseball game, reason being they hadn’t done so in more than five years, until Saturday. 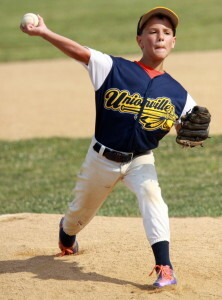 After playing arguably their worst game in that time frame, an 11- 1 loss to Ridley in the opening round of the 2012 Southeastern Pennsylvania 8u state championship at Warrington YA on Saturday morning, Unionville was almost flawless in their afternoon meeting with District Two runner up Towamencin. Eight-year old Carter Parise, who has been one the Indians most reliable hurlers all season long, took the hill in the most important game of his life, knowing what was at a stake. 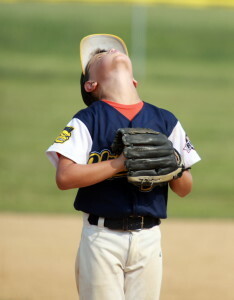 With the four game pool play format of the tournament, Parise was aware that a loss against the Titans meant that the hopes of a state title would probably wilt like the grass getting pounded by the sweltering heat as the mercury eclipsed the century mark. 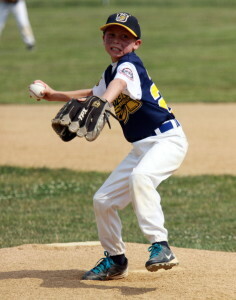 “I used my fastball on most of my pitches, it was important to throw strikes and let my fielder make the plays,” added Parise, whose favorite player is Chase Utley. Parise was sensational, setting the tone by putting down in order all six batters he faced in his maximum of two inning allowed of pitching, recording two strike outs. Parise (3-for-3, 2 Runs, 2 RBI) also sparked another aspect of game to the mix in the clash with the Titans, as the Indians offense, which was almost non existent in the earlier debacle, exploded for 11 runs in the four inning mercy rules shortened game. Jack Zungailia, who was noted by coach McClosky a one of those players that always “just does the right thing”, led the way with a 2-for 3 performance at the plate driving in two runs, smacking a double and scoring two as well, while Anthony Zucchero scored a run and worked two walks. Grant Hineman also chipped in with 2 RBI of his own on a 1-for 2 game at the plate, scoring twice in the process. As outstanding as Parise was to start the game on the mound for District Nine Champ Unionville, Pocopson fourth grader Cal Walsh took it to a new level as he pitched the third and fourth innings. Cal Walsh struck out five of the seven batter he faced in his state tournament pitching debut. 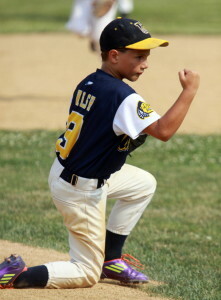 Walsh, whose favorite player is Derek Jeter, showed he is ready for the big time pressure, as he used his fast ball to strike out five of the seven batters he faced, with the final out of the game being recorded on a routine ground out to second base. But for a two out walk in the fourth, the Indians dynamic duo of Parise and Walsh, who did record a no hitter, would have combined for a perfect game. 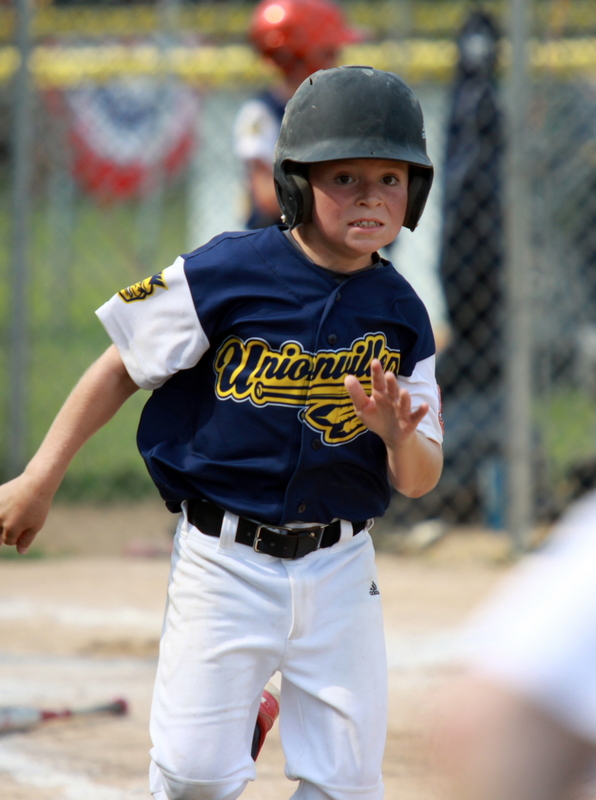 Unionville’s Cal Walsh takes a breath to compose himself before the final pitch of the tilt. I clicked on the website for the photographer to order a photo of my grandson from this tournament; I typed in my name and email as directed, however, when I clicked on the view album button, nothing happened. What’s the problem? I’m not sure, but we’ll make sure it gets sorted out as soon as possible. I’ll drop a note to Dave and put him in contact with you. I’m guessing we had an errant link. My apologies.